Knowledgeably and effectively challenge vocational testimony with this book’s pattern questions and supporting data. Problems with the DOT. How to attack other data sources used by vocational experts. Vocational information and analysis at Step Four. Vocational evidence at Step Five. Transferability of skills analysis. Includes a unique, 78-page annotated index/summary of the rulings. David Traver’s sophisticated handbook will help you (1) attack vocational testimony, and (2) use the Process Unification Rulings as powerful weapons for your claimants. Learn more about the DOT in an afternoon than most VEs learn in graduate school and 25 years of practice. Use studies from the National Academy of Sciences to rip apart reliance on the DOT. Use Social Security Regulations to prove the DOT is a dead letter. Are SVP data in the DOT reliable? See how the Social Security Administration’s reliance on the DOT bases its adjudication system upon outdated vocational science. Why didn’t anybody weigh anything when analyzing strength demands of the jobs in the DOT? There is no published source of data that could reliably be used to answer the typical hypothetical question at a Social Security disability hearing. Learn why. Make the O*NET work for your client, live on your computer at the hearing. Use the Occupational Outlook Handbook to blast VE testimony in sample cross-examination testimony. Use the part-time job card to trump VE testimony about vocational sources. Track an attack on VE testimony from a pre-hearing memo to a District Court decision. Stop losing cases at step-four because you don’t know what’s happening at the hearing. Was it really past-relevant work? Understand the Regulations and Rulings on-point. Does past-relevant work actually have to exist to be harmful to your client? Show how to protect your client from the DOT and other sources of vocational information in composite jobs cases. Use the handy Transferability of Skills worksheet. Benefit from reviewing comprehensive transferability of skills examples. Trump the VE with the Medical-Vocational Guidelines. The Commissioner does not know what a significant number of jobs is, so prove your favorite number for the record. Use occupational-based arguments to prove your case. Is a “vocational advantage” really bestowed by transferable skills in your case? Watch out for Fast problems in your grid arguments. Stop being baffled by transferability of skills questions. Make Specific Vocational Preparation work in your cross-examination. What mental abilities are needed for unskilled work? Use vocational information to disprove transferability of skills. Master the technical language of the Medical-Vocational Guidelines. Use the Rulings to prove your Grids case. Learn from sample cross-examination of VE testimony. “Claimants’ representatives and agency adjudicators alike have been heard to say that nonacquiescence applies to all court cases for which the agency has not issued an AR. Acting under such an incorrect assumption, some adjudicators maintain they may not apply the holding in any circuit court decision which is not accompanied by an AR. Such statements evidence a fundamental misunderstanding of nonacquiescence and an erroneous interpretation of SSR 96-1p. Under nonacquiescence, SSA …. Probably not. Nearly every aspect of Social Security adjudication is governed by the Social Security Rulings. Remind ALJs what the Rulings require with 93 “commands” to agency adjudicators excerpted from the Rulings. Rebut common but invalid reasons ALJs use to reject claimant’s allegations. Prevent the ALJ from rejecting a medical source statement based on the ALJ’s finding that the medical source was not aware of all the medical and other evidence in the file. Capitalize upon the provision in SSR 96-7p that the consistency of an individual’s statements is a strong indicator of the claimant’s credibility. Using SSR 96-8p, affirm that at Step 5 a claimant cannot be found “not disabled” on the grounds that the claimant cannot perform part-time work. Protect your claimants from DDS adjudicators’ and ALJs’ practices of arranging for unnecessary and/or inappropriate consultative examinations. Ensure a nearly automatic finding of disability by establishing specific limitations set out on the Mental RFC Assessment Form. Win market rate “bad faith” attorneys’ fees for nonacquiescence (SSR 96-1p). Use the “function by function” RFC assessment requirement in SSR 96-8p to develop Step 4 and Step 5 exertional and non-exertional RFC issues. Establish fibromyalgia and chronic fatigue syndrome as disabling impairments using SSR 96-3p, SSR 96-4p, and SSR 99-2p. Avoid greater weight being given to the opinion of the non-treating or examining physicians by giving a complete copy of the claimant’s file and obtaining a medical source opinion based on the complete record. Use interrogatories, instead of requesting subpoenas, to reduce the weight given to the opinions of non-examining state agency physicians and psychologists. 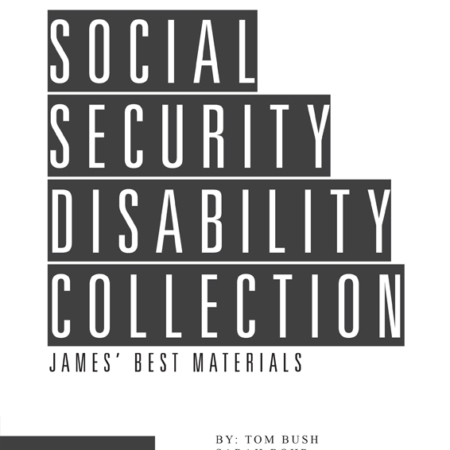 This update to Mr. Traver’s Social Security Disability Advocate’s Handbook adds a new collection of briefs, two handy checklists, materially expands the chapter “Attacking Vocational Expert Testimony,” and updates the rest of the book. This edition begins the formation of a growing collection of briefs written by the author. It starts with 9 briefs. The issues covered in each brief are listed on the Summary of Briefs at the front of the book. Attorney David Traver earned bachelor and master degrees in vocational rehabilitation with an emphasis in vocational evaluation. Professional rehabilitation employment included supervising a large vocational evaluation department where he earned a national award for outstanding rehabilitation program of the year. He worked as a government personnel manager before attending law school at the University of Wisconsin. He began practicing disability law in 1992. Attorney Traver hosts Social Security Advice CONNECT, at ssaconnect.com. Attorney David Traver is a sustaining member of the National Organization of Social Security Claimants’ Representatives. In addition to representing hundreds of claimants at the Social Security Administration, Attorney David Traver has represented claimants in more than 400 cases in United States District Courts.